If you think like your customers think and price them within their budget, then you’re more likely to be more successful in domain name investing. That’s how today’s investor turned a $69 SnapNames purchase into a $14,488 buy-it-now sale in three months. Listen into this Profitable Flip show to learn to think like he does in your own segments. Logan Flatt is a part-time domain name investor. 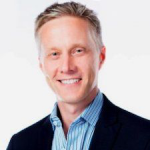 Flatt is also senior vice president at Ansira, leading data-driven, technology-enabled marketing solutions provider, specializing in the integration of local and national marketing programs through marketing automation, data analytics, CRM and performance media. Flatt has dual degrees from Southern Methodist University in operations research and mathematical sciences. He also is a Chartered Financial Analyst. MICHAEL CYGER: On today’s Profitable Flip show, an investor turned a $69 SnapNames domain name purchase – and yes, he was the only bidder — into a $14,488 buy-it-now sale in three months. And it’s not his first sale by a long shot because he has unique insight into the minds of chief marketing officers. If you want to know what they’re thinking too, this is the show you need to watch. MICHAEL: Hey Sherpa Network, thank you so much for joining me today. My name is Michael Cyger and I’m the publisher of DomainSherpa.com, the website where you can learn how to become a successful domain name investor or entrepreneur directly from the experts. This is the DomainSherpa show called Profitable Flips. In this series, I invite domain name investors to share all the details of how they bought low and sold high, and, in doing so, reveal some of the mystery around domain name investing. Today, I’m pleased to welcome investor Logan Flatt. Welcome, Logan. LOGAN FLATT: Hi there, Mike. MICHAEL: So, you’re in the great state of Texas, right? LOGAN: Yes, I am, Dallas, Texas. MICHAEL: All right, it’s great to have you here today. So, let’s jump right into it, Logan. What was the domain name that you most recently sold? LOGAN: The name was smartmonday.com. MICHAEL: Smartmonday.com, and what date did you purchase the domain name? LOGAN: I bought it February 15, 2017. MICHAEL: And when did you…So, not too long ago, and when did you sell it? MICHAEL: And what did you sell it for? MICHAEL: Wowza, that is crazy. So, you bought a domain name for $69 and sold it for not 10 times, not 100 times, it’s like 200-plus times what you paid in just over three months. LOGAN: That’s right, 92 days. MICHAEL: Unbelievable. That’s the kind of sale that I love to hear about, because it’s a prime example that refutes the, “I could be making money, too, if I had only started investing earlier,” argument. You know, it still shows that there are opportunities that happen every day, and you just need to, like, know where to look at them. LOGAN: That’s right, that’s one of the reasons why I wanted to talk about this name, so people can see that there are opportunities out there that, you know, may not be obvious. If you have negative nannies saying, “You should have been here 30 years ago buying these names,” you can still buy names today and still make good money. MICHAEL: Yeah. And you know who bought smartmonday.com, don’t you? LOGAN: It was Aon Risk Services out of Australia. MICHAEL: Unbelievable. If anybody doesn’t know who Aon is, they’re the largest insurance broker in the world. They do insurance, re-insurance, consulting, human resources, risk management…I think their top line is, like, $11 billion or something like that. They’re massive. MICHAEL: They’re all over the world, yeah. And I think smart domain names are a great purchase. I listen…You know, I personally, when I go running every day, there’s a few different podcasts that I listen to. One of them is Smart Passive Income. So, you got the Smart in front of, like, the noun or the verb. I’ve heard of smartmarketing.com before. I know Dow Jones owns smartmoney.com. I think it used to be a magazine as well. LOGAN: Yeah, in the ’90s. MICHAEL: Yeah, Smart Money. So, unlike in the ’90s, late ’90s, when everything was being labeled “e-this” or “i-that” before the domain name, “smart” hasn’t gone out of style. LOGAN: That’s right, that’s right. There’s a lot of brands out there. If you take a look around, just around you as you’re walking or shopping, just pay attention to the brands and you’ll see “smart” used a lot. MICHAEL: Yeah. You know, it’s funny, it’s one of those things where I’m interacting with them but I never really think about it. So, this is the kind of story that I love to expose other investors to because it gets them to just think more actively, what are the brands that I’m being exposed to. You know, it’s like the analogy where your best friend, or your friend, gets a new car. You’ve never seen that Kia, whatever, model before, and suddenly you’re looking around and they’re all over the place. Or, the new Tesla, suddenly everybody’s got a Tesla. MICHAEL: And smart domain names are selling for quite a bit of money. In our pre-interview, you were like, “Go over to NameBio, Mike, and search on “smart” at the beginning of the word, and sort by price descending,” and there are some really strong five-figure domain names there. LOGAN: Yeah, and that’s why I invest in them. MICHAEL: Smarttrade.com was $72,000, Smart Stop’s $59,000, Smart Ship’s $37,000. So, a whole bunch of different industries: smart watches, smart grids, smart camera, smart insurance. So, you provided me a spreadsheet identifying 35 domain name sales that you’ve made over the past 7 years and, you know, I’m not including as part of this because we wanna focus just on this one domain name. But, my point is that this isn’t a one-off sale for you. You’ve been, like, selling for a number of years now. Can I reveal what the total gross sales was, or do you want me to…? LOGAN: Sure, you can reveal it. MICHAEL: Which was phenomenal. Like, for a part-time investor, somebody that’s just, you know, has a day job and is doing something else, that’s a pretty nice return. LOGAN: Yeah, for a hobby. MICHAEL: Yeah. So, I wanna get into how you got into this hobby, and how you, you know, picked your words, and how this sale actually happened. Let me start by asking you, are you a full-time or a part-time investor? MICHAEL: Part-time. So, just like with stocks and bonds, some people are full-time, they trade all day long. Some people are part-time and they treat it like their retirement account, or, you know, a slow growth opportunity. What’s your investment objective? LOGAN: Well, to make money. I mean, in terms of domain names, I view domain names, really, as speculative assets. And so, definitely buying low, selling high is what I’m trying to do. So, I buy a lot of names at auction, you know, a lot of times I’m the only bidder on these names. But, when I start to think about what they’re worth, I try to think about what a CMO or a CEO might be willing to pay for it, and obviously try to maximize that spread between when I bought it and what I wanna make from it when it sells. MICHAEL: And are you trying to, you know…do you plow all of the profits back into your investing, or are you looking at it, sort of, as a 401K retirement account that you’ll just grow, take money out of your domain investing and put it into retirement? How do you view, like, your long-term plan for the money you make in investing? MICHAEL: Yeah. What’s your professional background, Logan? LOGAN: So, by day, I’m senior vice president of Strategy. We’re a marketing consulting firm and agency called Ansira, at Ansira.com. So, I consult to chief marketing officers, chief executive officers, about their…how they’re spending their marketing dollars. And the way we do it is, kind of, one-to-one marketing, where it’s the opposite of broadcast, opposite of broadcast TV and broadcast radio, where we’re trying to really target individual households or individual people, or even individual devices, because you’re using big data to really analyze the entire country of the United States and Canada. And then, we use statistical science to really analyze that data, and really score all the households to then sort them by how attractive they might be to one of our clients, in terms of which households appear to be the ones that are the most attractive for engaging them with messages or offers. So, it really cuts out a lot of waste in terms of impressions that people have got previously through broadcast TV and radio. And then, also, since we’re targeting people who are most likely to respond to an offer, we get much higher response rates and conversion rates, too. MICHAEL: Sounds like you’re…you know, you understand marketing, but it’s also…you sound like one of those quant guys, the guys that understand the analytics and love getting into all the details. LOGAN: Yeah. No, I’m definitely a quant guy. I’ve studied operations research and math in college. I’m also a charter financial analyst, so I’m just very quantitative and, just, love numbers and analyzing. MICHAEL: That’s why the spreadsheet you sent me with all your sales was so beautifully laid out, all the fonts were perfect, the color codings…it was like, mwah! Just beautiful! LOGAN: That’s what I do, you know? But the most important thing is, you know, analyzing all that stuff, but then telling a story to really help these large corporations understand how to spend their marketing dollars more effectively and efficiently. MICHAEL: Do you mainly serve large corporations, or could I hire you to target the households in the United States that are likely to try domain name investing, and then get them signed up for my newsletter? LOGAN: We’re pretty expensive, and…We work with large brands, but we also do work with some of their franchisee groups, you know, so we do work with some smaller budgets as well. But, for the most part, we’re working with Fortune 1000 companies. MICHAEL: Yeah. So, what kind of skills does your experience provide you that you think benefit domain name investing? LOGAN: Well, I think, because I’m working with CEOs and CMOs every day, I really understand how they think and what they like, and I’m able to kind of use that to…kind of, just years of experience, you know, working with them and working in business, to understand what makes a good brand name and what kinds of words are good words to use because consumers can spell them, they know how to type in the name after they’ve heard it on the radio or on TV or some other…and they can recall it easily. There’s a lot of words out there that people can’t spell, and then there’s tons of typos they might use to find a website. So, I’ve just learned, over the years, choose simple words in your domain names that are common English words, and you’re probably gonna do much better with those words. So, we’re gonna get into how CMOs think and what they like, and I’m gonna ask you exactly those questions as we’re going through the sale of this domain name. So, let’s start from the beginning. How did you first discover smartmonday.com? LOGAN: Well, it was on a drop list, and…I use a great website called ExpiredDomains.net. It’s put out by Marco Schmidt out of Berlin, Germany. Great website, really allows you to sift through all the drop lists and use filters. So there’s certain keywords that I just search on in that tool, and “smart” is one of those words. And so, I go through this list, and about 95% of the names that are dropping each week are not worth investing in but, occasionally, there are five or six of them that are worth investigating a little bit further and researching, you know, whether they’re trademarked or not. And Smart Monday just popped out at me, and so I went and I did some research on it, and then I went and put a bid on it. MICHAEL: Yeah. So, you’re saying, when you say 5%, I’m willing to actually take it more as, like, a real number, rather than just with a grain of salt. So, it’s probably like 5 out of 100 domain names. So, if you got 100 domain names listed in the list, you’re gonna look at maybe 5 of them, 95 of them are gonna be just total crap. You’re not even gonna spend any time on them. Five of them you’re gonna think twice about. LOGAN: Well, because, you know, I’ll scan them with my eyes and just know that “smart blank dot-com”, whatever the second word is, and a lot of them just aren’t attractive but there are occasionally some that are very attractive, and then I’ll research them further and decide what to do then. MICHAEL: Yeah. And so, does “smart” always have to be at the front, or can it be “something smart dot-com”? LOGAN: I prefer “smart blank dot-com”. I don’t like “smarter blank dot-com”, I just like “smart”. MICHAEL: Because you want…why do you want “smart” rather than “smarter”, “smartest”, or…? LOGAN: Because when they think of these brands, they’re thinking of conveying that their product is somehow superior to others, that it’s an evolved product, it’s more sophisticated, and “smart” is just a simple word, again, for consumers to understand and know how to type in. MICHAEL: Yeah, definitely. And so, once you find those five domain names, what do you do to determine if they’re worth bidding on? I then also look at the organic search results, to see what kind of companies are using those kind of words in their domain names already, because if they’re already using, you know, another domain name that’s longer, they might view this particular domain name as an upgrade. So, I’m looking at other companies and how they big they are, and, just, if there’s a lot of activity commercially in terms of people buying ads on those keywords. MICHAEL: And so, I don’t anticipate that there was anybody buying ads on “Smart Monday”, in quotes, when you go to Google and type it in. LOGAN: There weren’t, you’re right. There were not. MICHAEL: Okay. But you still liked this one. Was there any other tools that you used to figure out if this would be a domain name that is a good investment? LOGAN: Well, in the organic search results, there definitely were results of large corporations using the phrase “Smart Monday”. I think two were here in America, one was in Germany, I believe. But, what I do then is I go over to the U.S. Patent and Trademark Office, USPTO.gov, and I put in those phrases, into their search engine, to see if anybody has a federally registered trademark on that phrase. In this case, there was none. MICHAEL: Does it worry you if there are, or if there aren’t any trademarks? LOGAN: What I look for it in the search results at the USPTO.gov site is if the trademarks are dead or alive. If they’re dead, then I feel more comfortable about this name because they’re no longer valid in the trademarks. And then, I look to see if they’re alive. If they are alive, then I kind of go back to Google and I try to see, if that company has a live trademark, does it still exist, because even though the trademark might be alive, the company may be dead. And, if that company’s not paying their lawyers anymore, you know, it’s unlikely they’re gonna come after me for this particular trademark that may still be alive even though the company’s bankrupt. LOGAN: So, I was trying to mitigate my risk in terms of just ensuring that no one has an active trademark, or that run an active business with that trademark, to help mitigate the risk because there’s a lot of risk if you do end up buying a trademarked name. MICHAEL: And you just wanna steer clear, it’s not worth your time, there are more other…there are plenty of other domain names to go after? LOGAN: Yeah, and just, I think, trademark…I think domain names are risky because they’re highly in liquid, there’s not an active exchange to trade domain names like there are stocks and bonds. And then, you have the legal risk from the Anti-Cyber Squatting Consumer Protection Act of 1999, which is a legislation targeted specifically at this issue. And there are, I’ll tell you, $100,000 potential liability if you, you know, buy a name like that and they go after you. So, mitigating your risk by ensuring there are just no active trademark on that term is very important. MICHAEL: Was there anything else you did to back up your gut feel that smartmonday.com was a good investment before you put in your bid? LOGAN: I did the trademark search, and I did…I just, again, assessed, real quickly, just how many companies there might be and that they’re large. I liked Monday because, as a business thing, the business week starts on Monday, it’s kind of a very important day to businesses. It might be…Friday might be important, too. But, you know, Tuesday or Wednesday or Thursday, if it was Smart Tuesday, Smart Wednesday, Smart Thursday, not as attractive to me. But Smart Monday, to me, seemed like a very good business term. MICHAEL: Yeah, it makes more sense. Saturday, Sunday, nobody cares because you’re not at work. Friday, you’re already thinking about the weekend. You want employees to be on their game when they show up on Monday. And I don’t even know how Aon’s gonna use it, maybe…you know. LOGAN: I researched it. They decided to start a new company on April 17 of 2017 called Smart Monday, and it’s part of their Aon Hewitt division out of Australia. I think it’s a spin-off or something. But they decided to name it that, and I just happened to get it at the right time. MICHAEL: Interesting. All right. So, you put in a bid at SnapNames, is that where it was? LOGAN: That’s right, and I was the only bidder at the auction. MICHAEL: Does that worry you at all that you were the only bidder? LOGAN: No, because I think there’s ample opportunity for everyone in this market. There’s so many names out there and there’s so few investors. I mean, we’re, I don’t know, several thousand, probably, investors around the world looking at these drop lists every week, and I just think we all have different strategies and we’re all doing different types of investing. And sometimes there’s a great name and we all get on and start bidding up the price and everything at wholesale. But I think there’s enough opportunity to go around, where if I’m the only bidder but I’ve got this logical reasoning in my head based on experience of what I think makes the name valuable to a business user, then I’m totally confident being the only bidder. MICHAEL: Yeah. So, you’re the only bidder. The…SnapNames gets the domain name. Immediately, they say, “Congratulations, you are now the owner of smartmonday.com.” What’s the very first thing you do when you acquire a domain name? MICHAEL: What’s the very first thing you do when you acquire a domain name? LOGAN: Well, the first thing I do is I list it in the Uniregistry Market. That’s kind of how I manage all my domain names is in their market. And then, immediately, as soon as I get access to the name at the registrar, I go and change the DNS servers over to UniregistryMarket.link in their name servers. And then, I put a price on the name, so that the landing page resolves within the name I just bought. And so, it’s immediately in the market, ready for a potential buyer to find and potentially buy. MICHAEL: Yeah. And the Uniregistry Market, are you using a lander that says, “This domain name is for sale. Here’s the Buy It Now price,” or are you using a lander that has advertising on it? LOGAN: I’m definitely using a landing page without advertising. I don’t…I’m not a big fan of the paid, pay-per-click. There’s additional legal risks related to trademarks there. Historically, I’ve done, you know, landing pages where you just fill out a form, say [inaudible 00:20:00] in this name, put in your information, and I’ve talked to potential buyers and negotiated, etc. But, this year, I decided that the first six months of the year I was gonna conduct a test, where all the names that I have put out there on the market for sale, I was gonna put them all at Buy It Now prices, and I was gonna see, for six months, how does that perform and, you know, what kind of results will I get. And so, in conducting that test, every name I’ve been getting and buying I’ve been just putting up a Buy It Now landing page at Uniregistry Market, assigning a price, and waiting. MICHAEL: And so, what are the results, Logan? Don’t leave us hanging! LOGAN: So far, the first three months, I’ve sold three names. You know, Smart Monday was one of them, tiresnearme.com was another one, and then alliancegold.com was another. I think it was about a total of close to $20,000, using that particular strategy. MICHAEL: And how many names do you have that were…? Did you go in and reprice all your domain names, and how many domain names was it? LOGAN: I have about 1,000 names, and assigned prices to all of them. I sold three in six months so I don’t have to house them, and, you know, $20,000 in six months is pretty good. MICHAEL: Yeah, yeah. That’s double your reg fees right there. MICHAEL: So, first thing you do…So, I’m gonna ask you more about your pricing system. But, before we go there, I wanna figure out what else you do when you buy your domain name. So, the first thing you do is you go to Uniregistry, you add it there because you’re using Uni to manage all of your domain names, and then you, as soon as you get access to the domain name, you point the domain name DNS there so it resolves and it shows the landing page and it shows the domain for sale with a price. Do you add it to any other marketplaces? LOGAN: I do. I add it to Sedo and to Afternic, but I do adjust my prices there because of their commissions. MICHAEL: And so, what are the commission differences, and how do you adjust your prices? LOGAN: Well, I think Sedo and Afternic add about 20% commission. So, what I do is, when I decide on my pricing that I’m gonna use on the landing page at Uniregistry Market, I take that price and divide it by point-eight, which is the same as increasing it by 25%. And those are those increased prices where I list over at Sedo and at Afternic so that, if it does sell over there, they take their 20% commission out and I end up at the same…my proceeds are the same as the price I have listed at Uniregistry Market. MICHAEL: Right. So, a smart buyer would probably search all the marketplaces, see it’s cheaper at Uniregistry, and just buy it there, but that’s not really how CMOs work. LOGAN: They type in the domain name, see what resolves, and, you know, I’m hoping they just Buy It Now right there at Uniregistry. MICHAEL: Yeah, yeah. Awesome. So, how do you determine and set the retail price for a domain name? You know, smartmonday.com actually had a lot of drops before you bought it, and it was dropped when you bought it. Tell me about that. LOGAN: Yeah, Jamie Zoch over at DotWeekly did some research for me on it, and he looked and used domain tools to look at historical, you know, registrations, and saw, I think, from 2007 onward…no, I think it was 2012 onward…that a domain investor had bought it, and then one year later let it drop. Another domain investor bought it, let it drop, every year until 2017 when it dropped and I picked it up. In fact, the investor who owned it before I did had it priced on a Uniregistry Market landing page for only, I think it was, $1,495. He let it drop in February. When I picked it up, I slapped on $14,488, and, you know, 90 days later it sold. MICHAEL: And so, regardless of whether you had a $14,000 price tag or a $1,400 price tag, it probably would have sold if that investor would have kept it one more year, or if the investor, ten years ago, would have paid ten times the $10 registration fee, $100. They would have gotten a sale as well, most likely. LOGAN: Right. And it just goes to show how important timing is. I mean, you know, I could have been one of those previous investors who let it go, but I just happened to be the one that picked it up in 2017 and put a price on it that was attractive to me, and it sold. MICHAEL: Yeah. So, how do you determine, you know…clearly, your value on the…a lot of…let me back up. A lot of domain investors say, “I wanna get 100-time return.” So, if you buy it for…10-time return. So, if you buy it for $69, you might wanna get a $690 return, and hopefully you’ll sell it within a few years so your profits are maximized. You set your price at $14,488. How did you determine that from smartmonday.com? LOGAN: Yeah. I mean, most names that I buy and list, I do price below $5,000, so $4,488, because I have seen, from my own working with clients, them just be willing to pull out a credit card to buy a $5,000 name. They probably get frequent flyer points for doing so, you know, and they can just list it on their expense report and have their boss sign and approve it. It’s a very easy transaction. So, when you’re below that $5,000 price point, places like Uniregistry Market allow them to use their credit card. So, just removing all the friction, pricing it at a certain price point that allows them to use their credit card is very important. I think, for higher quality names, though, they might be willing to pay up more for. In that case, they probably have to do a wire transfer that might involve getting their finance department involved to handle that. Sometimes, you know, CMOs or the other marketing folks don’t wanna get the CFO involved, if at all possible. So, pricing it below $5,000 is a good place but, on some of these better names, it’s worthwhile because, if it’s such a good name to them, they’re willing to, you know, let other people in their organization know that they’re buying a name at a higher price because the name is so good. So, in this case, I felt, given the number of companies that might be interested in Smart Monday, that there was probably enough demand where one of them, at least, was willing to pay a higher price for it. MICHAEL: Yeah. And how many pricing tiers do you have besides the, you know, sub-$5,000? LOGAN: Yeah. So, I’ve got several. I’ve got $2,488, $4,488, $7,488, then $9,488, $12,488, $14,488, on and up and up until about $94,488, you know. So I just kind of do these different jumps, just based on my own sense of, over the years, having done this for a while, having a sense of what a company might be willing to pay for the name, and particularly how many companies are out there who might be interested in the name because, just, again…If there’s multiple large companies who might be interested in this name, you can probably go higher on the price, particularly if there’s no registered trademark for those phrases. MICHAEL: And why do you end all your pricing in $488? LOGAN: Just a marketing thing, it’s perception. It’s like, you know, $19.95 instead of $20, $14,488…there’s even a bit of superstition from China there with 88 [cross talk 00:27:17]. I’ve got a Chinese girlfriend so, you know…so, just probably that. MICHAEL: And do you price most of your domain names under…you know, of the 1,000 you have, what’s your bell curve? Are most of them below $5,000, and then you’ve got a few in the…? LOGAN: Yeah. I would say a lot of them are $2,488, but I do have a lot of $7,488. I kind of like that next tier up from the $4,488 because it’s one of those names that are kind of those…they’re better than the ones that are $5,000, or $4,488, and a CMO might be willing to stretch a little bit further to get that $7,488 name. MICHAEL: Yeah. And so, you just started this pricing experiment for six months. Did you have any of your domain names priced before January 2017? LOGAN: I had some of them at Buy It Now prices, but most of them I just had the form that was available where they can just fill out their name and information, you know, and then I would talk to them. But I kind of like this particular approach of doing the Buy It Now because it’s less friction for the buyer. They can be interested in the name, type it into the browser, see a price, and then that’s up to them to go find the money that they need to meet that price. A lot of them might be intimidated by having to, you know, negotiate with somebody for this thing called a domain name. But, if they just see the price, they can figure out themselves if they can afford it or not, they can go find the money, push “Buy It Now”, simple, easy. So, it’s just smoother and less friction. MICHAEL: Yeah. So, your top tier is $94,488. Do you ever worry that you’re leaving money on the table by pricing something at $95,000, when somebody with bigger pockets could come along and think that it’s a good buy at $150,000? LOGAN: All my prices are prices that I’d be happy with. So, I kind of determine…I’ve got, kind of, terminate in advance. Yeah, you know, if this big company came along and they were…a lot of these companies are multi-billion dollar companies, just like Aon, you know. Aon could have afforded to pay even more, you know. So, I don’t shoot myself in the foot or worry about it or second-guess myself that, you know, I could have gotten more money. It’s, the price that I put on the name in advance is a price I’m happy with. MICHAEL: Right. Do you ever worry that you’re over-pricing your domain names, and not getting sales because you’d be too happy that your domain names were sold at that price? LOGAN: Well, that’s probably what the testing’s about. I mean, you know, in the next go-round of testing, I might decide to lower my prices for six months to see if I get greater pull. But, the other thing there is, because I’m trying to choose names that multiple companies might be interested in, in those six months that I had these high prices out there, the right company just may not come along. It may be the next six months or next year that the right company comes along, and that price, they’re happy to pay it, it’s no big deal to them. It’s easy to buy because there’s a “Buy It Now” button. You know, it’s just a matter of having patience and waiting for the right company to come along. MICHAEL: Yeah, yeah. So, you set your Uniregistry Buy It Now price, Aon came, typed in the domain name, saw that it was for sale, clicked the “Buy It Now” price. Does Uniregistry act as the escrow agent in that case? LOGAN: They typically do, but in this particular case they did not. Aon used a proxy buyer, which is CSC Corporate Domains, a professional organization that buys domain names for large corporations, and manages their domain assets for them. So, the buyer was really CSC Corporate Domains, and they prefer to use escrow.com. So, even though Uniregistry Market provides escrow services, this particular buyer prefers escrow.com, so we did it through escrow.com. MICHAEL: Got you. And then, when you’ve got it set up at Uniregistry, how do you start the…how do you push the transaction to escrow.com? MICHAEL: So they click “Buy It Now”, and then they worked with Uniregistry to make sure it went over to escrow.com? LOGAN: Yeah, and Uniregistry works with CSC all the time. They know CSC’s preferences, so as soon as the person behind the scenes saw that it was CSC, they already knew it was gonna probably be an escrow.com transaction. MICHAEL: Yeah, that makes sense. How long do you expect to hold domain names when you buy them, Logan? LOGAN: I typically have a five-year horizon where I think that, if I’m gonna invest in this name, I’m willing to renew it for about five years, unless it’s so future-oriented in terms of, you know, a thin tech name or any kind of future tech name. It might need a 10-year horizon. But, typically five years is what I’m willing to continue to renew the name, unless it’s just a clear mistake. When I go through my portfolio, you know, constantly, and I just realize, that was a dumb investment to make, I should let that one drop. But most of them I’m willing to do for five years. MICHAEL: So, Smart Monday, if you bought it six years ago, would you have dropped it by now? LOGAN: Who knows? Maybe so, [inaudible 00:32:24] dropped it, I don’t know. MICHAEL: And so, $14,400 and change gross profit on this. You had some escrow fees, maybe. In this case, was escrow paid by the buyer or you, or was it split? LOGAN: It’s paid by the buyer. MICHAEL: Paid by the buyer? LOGAN: But Uniregistry does charge me a 10% fee, and so they did take 10% of the gross price. MICHAEL: So they charge…So, although Afternic and Sedo charge 20%, Uniregistry takes 10%, because you’re using their platform to sell the domain name. LOGAN: That’s correct. That’s one mistake I made setting up my test, is that I forgot that Uniregistry charges 10% and I should have adjusted my prices a little higher, even at Uniregistry, to get the net proceeds that I wanted for each name. So, on my next test, I’ll probably adjust all my prices to account for that 10% fee that Uniregistry charges, too. MICHAEL: Yeah. So, did you splurge on anything with the proceeds from this sale? LOGAN: Yes and no. You know, since I do have 1,000 names and I’ve gotta pay $8,000-9,000 a year to renew them, I reinvested that money back in the business. Also, I’ve made a lot of purchases this year so far at auctions, so I gotta pay for those names as well. But, I did use some left over to take my girlfriend to Las Vegas, and we had a good, long Memorial Day weekend. MICHAEL: Nice, that sounds great. So, considering all the domain purchases and sales that you’ve made to date, are you in the black or are you in the red, roughly? LOGAN: Well, for this year for sure I’m in the black, and I think, longer term, over the period that I’ve been investing, I’m probably breaking even, you know. But I really feel like this year is the year that I’m gonna turn the whole thing black. I think I’ve got some names that can sell for even more money in the future, and even the back half of this year I might have a few more sales that would make me more black this year. MICHAEL: Awesome. And so, what are some of the other keywords besides “smart” that you look at on a regular basis, that you’re willing to share with other investors? LOGAN: Yeah. So, I think, from a marketing standpoint, some words that marketers like are, like, “smart blank dot-com”. I think, also, a lot of corporations like “blank hub dot-com”. So, like, machinelearninghub, things like that. So just, you know, generic words with the word “hub” at the end. And they create a lot of products, or a lot of…even if their websites, they’ll have little sections. Like, I think IBM has a Machine Learning Hub section, and some of those companies like to buy the domain name that matches the name of that section of their website and just point it at that section. I think “connect” is another name that a lot of corporations use to name, certainly, internal type portals and things like that, but also for consumer focused websites they use the word “connect” at the end of a brand name. I think “my”, so my…like, I have myfinancialreport.com, you know, that’s another name that companies like to use is “my blank dot-com”. Some names like that, I think, are things that, typically, a corporate marketer kind of likes to use and I see it commonly used, and so, therefore, I invest in those kind of names. MICHAEL: That makes sense. And so, if I wanna get more into the mindset of corporate marketers, marketing directors, what kinds of things do they read, and what kinds of things do you read, to better understand them that our audience might wanna pick up or read at the library or read online to get that understanding themselves? MICHAEL: That makes sense. So, you’re basically focused on businesses at all levels, Wall Street Journal, established companies, and Tech Crunch, you know, fledgling companies, and you wanna understand where the trends are. And then, knowing that, you then put your marketing hat on to figure out which kinds of domain names would be worthwhile, based on other domain names that you’re seeing used in the marketplace. LOGAN: Yeah. Like, with “robo-advisor”, you know, I hand-registered “robo-advisor connect” and roboadvisortools.com, and just things like that that, as that word becomes more and more important in the industry, potentially I have a name that a large financial services company might wanna buy. MICHAEL: Yeah, definitely. Any other insights into the way chief marketing officers, marketing directors, think on a regular basis with respect to domain names? LOGAN: I think it’s…certainly the simplicity of words that we talked about, and thinking about consumers and whether or not they can spell it, if they hear it can they repeat it back and be able to type it in and find it. So, very simple words, nothing too complex. Like, you know, “smart” is a great substitute for “autonomous” or “automatic” or “automated”, you know, these long words that people can’t spell, that are intimidating words. So, just words that are short, simple, and have a positive connotation is another thing, you know, very, kind of, positive words, because that’s what a CMO kind of wants to brand a product or service around. So, yeah. MICHAEL: Cool. You know, I’m really curious. When people listen to the DomainSherpa show, we chat in the pre-interview that you download the show Monday on your iTunes, that it just downloads automatically and then you listen on your way to work but it’s only a 10-minute commute, so then you listen at lunch. Let me ask you, Logan, what is it about coming on DomainSherpa that was of interest to you? LOGAN: I think, for me, you know, I’ve been kind of behind the scenes. I’m, like I said, a hobby investor, if you will, even though I’m doing successfully with it. I kind of wanted to come out more and share some of the things that I’ve learned along the way that can help new investors who are coming into the market. You know, I just wanted to be able to share my insights and have people know that I’m out there, bidding actively on these names, and they may not have known me before but I’m definitely out there competing against them. And I think it’s a lot of fun. I love domain name investing. My license plate says “DOMAINS”. LOGAN: Yeah, yeah, I’ve got the Texas license plate for “DOMAINS”. And so, I’m just very passionate about it, and I just like helping people and like to see people succeed and make money. It’s a very exciting industry. I love the fact that it’s like real estate but it’s virtual. You know, and there’s so many…you have the English language, everything else, and there’s numbers to it as well. It’s just a really diverse, fascinating industry. MICHAEL: Yeah, I agree. If someone wants to view your portfolio, is there somewhere they can go to see all your domains? MICHAEL: Right, which is what I did during the pre-interview. I’m like, oh, you have that one, that’s a great domain. LOGAN: Exactly. So, if people wanna use…I use info@mediacode.com, that’s the name I typically use for most of my registrations. And so, they can probably see all my names that way. MICHAEL: Cool, all right. Let’s see here. So, you’re gonna run with the current priced strategy for six months, so it’s January through June, roughly? MICHAEL: So, the end of this month. And then, at the end of this month, what’s gonna be your process going forward for the rest of 2007 with respect to pricing domains? LOGAN: Well, I wanna consider some other tests. Based on the way this one’s going, I might continue it for another six months. But, another test I wanna do is the, what I call, the Josh Eisenhower test, where I’m kind of fascinated by what he does in terms of…he goes out and finds names that were kind of neglected during the auction period, people didn’t buy any at the auction. But he goes and kind of grabs the ones that are available now, and buys them for $8, thereby registering them. I think he also buys some domain names in bulk as well. But, the idea is that he buys them for only $8, and then he puts very comfortable prices on them once he gets them, like $299, $399, maybe $499, that are very frictionless, that allows more people to be able to afford them and buy them. And, as I understand from some of your discussions with Shane about what he does, he might be selling 10 to 20 or so names a month, and you do the math, that’s pretty good money. MICHAEL: Yeah, yeah, exactly. So, you might try some of that yourself? LOGAN: Yeah, I might try some of that and see what kind of results I get. I think, also, you know, this year, I’m gonna start moving more into some of the single word dot-coms as well, just like everyone else is doing. But, I wanna start testing to see, if I do pay up for some names, you know, do I have the opportunity to sell some of those names at a high multiple to large corporations as well. I haven’t done a lot of single word dot-coms, but I wanna potentially move into that. So, I think those two approaches I might start to test in the back half of 2017. MICHAEL: All right. Has my video frozen up for you, Logan? LOGAN: It has, yes it has. MICHAEL: Yeah, let me just quickly turn it off and turn it back on here. MICHAEL: See me again? All right, great. So, you know, you mentioned repricing, thinking about a different strategy. I love the fact that you’re thinking tests, right? I’m an engineer. I wanna do a controlled test, I wanna determine if it was successful or not. I wanna glean some lessons learned, and then I wanna use that information as I move forward, and that’s exactly what you’re doing and it makes sense because you’re in research operations. And so, you’re gonna…that’s sort of a higher level, right? So, once every half a year, you’re gonna take a look from a strategy level, and try and figure out if your strategy is working. If we take it down one level to your tactics, what does your investing typically look like on a daily basis? Do you look at drop lists every single night? LOGAN: Yeah, pretty much, or, you know, maybe every other night. LOGAN: Yeah. But again, the ExpiredDomains.net tool is awesome for just cutting it down to an hour. I mean, I can probably knock it out in an hour in terms of touching all the lists. In terms of the keywords that I’m looking for, or just going through all the ones that are dropping on NameJet, or SnapNames, you know, it makes it very efficient and very easy to do. MICHAEL: Yeah, yeah. And so, about an hour, once every two nights, is all it takes you, based on your search criterias that you’re using right now? LOGAN: Hour, hour or two, yeah. MICHAEL: Yeah. Do you do it while you’re watching TV, or do you enjoy it so much you’re like, I’m focused on it? LOGAN: You know, I’m such an internet guy, I don’t even watch TV. You know? I gave up TV about 20 years ago, and…because I’ve been on the internet since 1988. I mean, I’ve been on there a long time, back when it was mainframes and green screen and TelNet and Gopher and all that stuff. So, I’m just an internet guy. MICHAEL: Yeah, awesome. If somebody wants to contact you to discuss something, you know, something you mentioned, network, what’s the best way for them to reach out to you directly? LOGAN: It’s probably my email address, just logan@loganflatt.com, and that’s Flatt with two Ts. I’m thinking about the back half of this year, working on a investment guide to kind of help people out called “Investing in Domains”, and I own investingindomains.com. So, hopefully this year, I’ll probably put that out there, and if people wanna find out when it’s actually live then they can send me an email and I’ll let them know when it comes out. MICHAEL: That sounds awesome. And I’m looking forward to staying in touch with you so that we can find out how your experiments are going, you know. Based on the strategy you’re setting, how does your second half of the year look, and maybe we’ll get you back on to DomainSherpa as a return Sherpa to talk more about that strategy and implementing the tactics. LOGAN: I’d love to come back. MICHAEL: If you’re watching the show and you’re like, “Mike, you forgot to ask this question,” please post a comment in the Q&A, in the comment section below the video on DomainSherpa, and I’ll ask Logan to come back and answer as many as he can. If you found educational benefit from the show, you learned something new, you were inspired by what Logan’s doing, please take 10 seconds to either post a comment below this video or…are you on Twitter, Logan? LOGAN: I am on Twitter, @loganflatt. MICHAEL: Okay. Or, go down to the button below this. I’m gonna have a tweet to Logan to thank him for coming on the show. Logan Flatt, I’ll be the first to thank you for coming on DomainSherpa, sharing all the details of your profitable flip, and thanks for being a Domain Sherpa for others. LOGAN: My pleasure, thank you so much. Great interview Michael and Logan! great to see what works month-month and year to year! As always Michael great work! What a great interview! Thanks guys! Thank you Michael and Logan. Truly amazing interview with heaps of priceless information “nuggets” to assist with searching, holding, AND selling domain names. I look forward to hearing more of your exploits Logan. Keep up the amazing work Michael. Definitely one of the better (I would say best) interviews for the year. Congrats. on the flip and Mike, its going to be tough to beat. Logan, Congrats. on the flip and Mike, this interview is going to be hard to beat. I used to own that name. OUCH! Hand registered it at Uniregistry. Immediately listed it with a for sale page at Uniregistry’s MarketPlace. Zero Inquiries …Zero Leads …Zero offers. So, let it drop in Jan.
I’ve been in a more dog eat dog world of commercial real estate for almost 30 years, but I’ve tried to have the attitude that the pie is large and there’s plenty for everybody. It is so refreshing to be learning about this industry and have people like you with a generous spirit. Thank you for your tireless service to us, including choosing and doing such a good job interviewing your guests. Mike, I was into commercial real estate for over 30 years too. What’s going on today in the domain industry is much like CR was in the 1980’s. It was fun then. This industry recaptures a lot of that for me. It’s the most fun industry I’ve encountered since then. The spirit of cooperation these guys have is incredible. It seems that there’s still a lot of money to be made here. And the industry still has that renegade thrill to it. There even seems to be room for newbies like myself. Who knows, we may meet at some event and trade war stories. A terrific show. Logan I like your “testing” methods and also, took to heart the pricing on your domains. I used an ending of 88 on my For Sale names and it just looks better and more friendly. I also, liked the comments on pricing at a sub-5K level for some domains-it is easier to get the credit card purchase-as Frank Shilling pointed out during a previous DS show. I too, agree on focusing on industries with larger pockets can result in larger sales-and profits. Plenty of opportunities to be had for everyone. My particular focus is on Investment, Finance and Legal names. If you have an interest in that area-we might want to exchange notes, someday. Thanks for setting the bar high. I hope to hit a few larger ones myself, someday soon! As the Domain King-Rick Schwartz used to say, “The more they delay, the more they’ll pay.” Ha! Excellent show. Thank you Logan and Michael! Logan, your methodical approach to investing and selling carried over to the way you explained your process. Clear and concise. With some valuable insights. I had someone recommend uniregistery.com just the other day. My domains are parked at a couple of different locations. neither of which are helping me much. I planned to move them but I was unsure about the aspect of allowing advertising. I liked your take on that. How many names total do you have in your portfolio? Hi Deborah. In the interview I discussed having 1,000 domain names. I am probably closer to 1,100 domain names at this point. I consolidate my domain names at Uniregistry. After I win an auction, I work to get the domain name moved over from the post-auction registrar over to Uniregistry as soon as I can (I often have to wait 60 days due to ICANN rule), which means paying to renew it for another year at Uniregistry. Since I intend to hold for at least 5 years, it’s “on strategy” anyway. I’m way behind you in numbers. Still fairly new at this, so I’m just learning. The domain name in my email address, which is mine, got me a seat at the big kids table pretty quickly. I have Ali Zandi marketing it for me right now. But I only have a couple of hundred domain names so far. I actually sprung for a fair number of emoji domains after the show on that. They captured my imagination. But for a numbers guy like you, I think it would be hard to come up with any data to support an investment like that. I’m going to try uniregistery. I liked your process for selling names. It’s logical and the methodology makes sense. Also, I buy my domains typically for 5 years as well. Trying to remember to renew them after you’ve hit a certain volume would be an unnecessary hassle. Thanks for getting back to me. I sent you a LinkedIn invitation. Great job on the show. Thanks for sharing your experience. Thanks Michael and Logan for a great show. Quality name. Congrats on a great sale. This was just a fantastic “Webinar” to me. Yes, it was a webinar. Mike, Thank you for the great interview. Mr. Logan Flatt, I’m sorry I don’t have Tweeter or Facebook. sincerity responding questions I doubt others would do it. Thanks, DNEverywhere. By the way, I recently picked up FinancialWebinar.com on the drop. Haha! Logan seems to be a great guy. Very nice to hear the story of another domainer who is having success. A great interview. That’s a fresh perspective to domaining. I think along the lines of Logan too, as I have been associated with some startups. Speaking of robo advisor names, I see great value in them, and got a great name, RoboSaver dot com. Hemant – Nice name with RoboSaver.com. Although, a Google search shows that “RoboSaver” was formerly associated with malware or virus, so it may be slightly tainted. Still, RoboSaver is a good brandable name for a product or service in the financial services industry, especially in the modern fintech sense. Now, why not go and put up a BIN landing page for a price that you’d be happy with and help the potential buyers buy it from you? Make it easy for them to buy! Great interview. It did give me some ideas to find domain names on the drop. what kind of keyword you are looking? How can you test the live trademark? Hi Satyadeep. I explained in the interview that I use several different keywords in my quest for valuable domain names. I mentioned a few keywords that I think corporations like to use in branding. I also explained in the interview that I use USPTO.gov to discover if a name has a trademark conflict or not. The USPTO.gov clearly shows where the trademark is “LIVE” or “DEAD”. Thanks Logan and Michael for sharing this inspirational story. Thanks Michael for sharing another wonderful interview. Congrats once again Logan and thanks for being very open. Wish you all the best in future. @Michael – Kindly change Sato to Sedo which is used by mistake at all places in transcript. Where to find the potential buyer?????? Hi Rahul. I explained in the interview that, during this particular test period, I simply wait for the buyers to approach me using a Buy-It-Now landing page at Uniregistry.com. You can also use Efty.com. If your domain name is good enough, it should sell within a year or two. Patience is the key! because i have domains to sell . and in my opinion it great domain since i test via semrush . more than 27 k search per month and MANY Ads on there. I generally do not buy directly from other domain investors so there’s no need to send me your domains. If you have a really good domain name, I will likely find it through my own independent research and then reach out to you about it if I want to buy it. It’s better that way. If you are actively trying to liquidate your names, why not just list them all at auction on Flippa or GoDaddy and let multiple domain investors fight over them? It’s better to get multiple domain investors bidding on your names at one time to get a fair wholesale value for your names. Give it a shot!